Kirsten Gillibrand has become the latest US Democrat to join a crowded race to be the party's candidate for the 2020 presidential election. The 52-year-old senator for New York confirmed her bid in an online video released on Sunday. Fourteen other Democrats having already declared they will seek the nomination. They include Senators Elizabeth Warren, Kamala Harris and Bernie Sanders - who ran against Hillary Clinton in 2016 - and ex-Texas Congressman Beto O'Rourke. 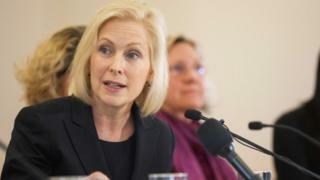 In the video officially launching her bid, Ms Gillibrand takes aim at President Donald Trump, saying: "Brave doesn't pit people against each other. Brave doesn't put money over lives. Brave doesn't spread hate. Cloud truth. Build a wall. That's what fear does." Which Democrats are running in 2020? What are the Democrats' big ideas? Elected in 2009, the senator rose to prominence campaigning against sexual harassment, sponsoring a bill to change how sexual assaults in the military are prosecuted. In her campaign launch video Ms Gillibrand voices her support for paid family leave, universal health care and the Green New Deal - a set of proposals aimed at restructuring the US economy to tackle climate change. The video ended with an invitation to her first major campaign speech, outside the Trump International Hotel in New York on 24 March. She had announced in January that she was forming an exploratory committee for a run. On Saturday, former Vice-President Joe Biden dropped a major - but apparently accidental - hint that he wants to challenge Mr Trump in next year's election. Media captionHas Mr Biden publicly announced his presidential bid? Addressing Democrats in his home state of Delaware, he said his record was the most progressive "of anyone running for the United-" before correcting himself: "anybody who would run". 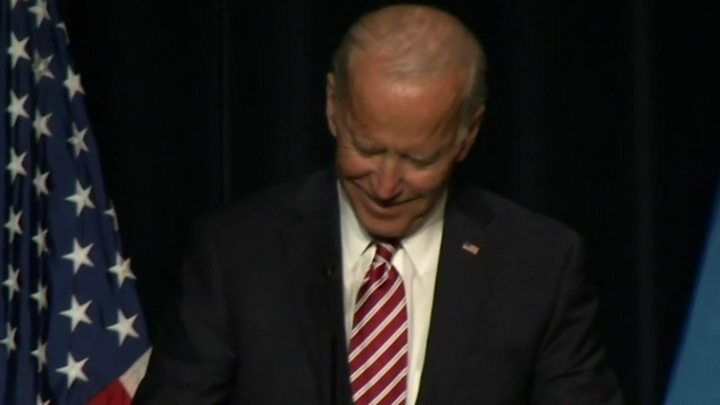 The audience chanted "run Joe run", while Mr Biden crossed himself and said: "I didn't mean it!" Speculation that Mr Biden would announce his candidacy has reached feverish levels. Democrats 2020: Which candidates have joined the race? Green New Deal : Can this plan pushed by some Democrats really work?